It is a busy football party season in our neck of the woods. 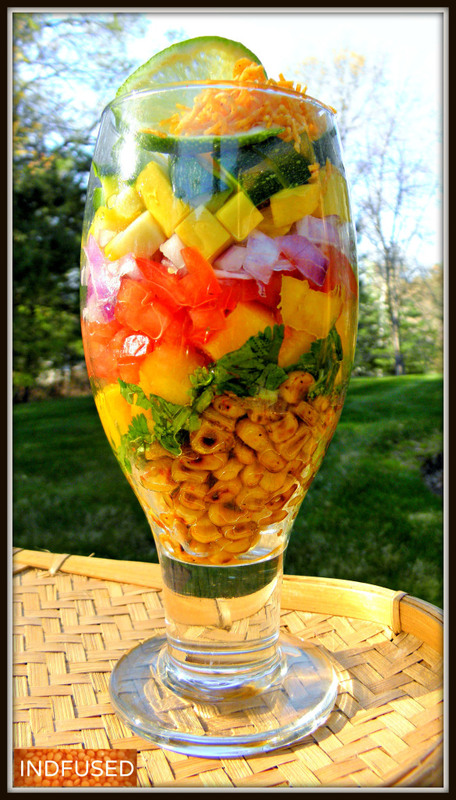 I thought of making this popular, crowd pleasing Corn Bhel Salad for the party. You can use frozen corn, roasted or corn on the cob, roasted on the gas stove or under the broiler in the oven. Hope you enjoy this corn bhel salad too! Corn Bhel Salad- Perfect for the season! Corn Bhel is a very popular street food in many parts of India. The aroma of the corn kernels being roasted in the huge pan wafts through the evening air …. you turn to look and see the spiced corn mixed with finely chopped onion and cilantro, topped with crisp sev…..and you find your taste buds won’t let you rest until you have had Corn Bhel! The other popular street food is the corn on the cob, freshly roasted on hot coals. That has been my favorite for a long time. Microwave Sesame Seed Laddus in 1½ minutes! That is beautiful. It looks like it would be a perfect feast for the eyes as well as the taste buds! So good!! Fresh and packed with flavour!!! You are so creative…this looks great and yummy! Looks so yummy and delicious. The arrangement is chanceless. Lovely presentation. Thank you so much Sowmia! Thank you so much Sowmia. Btw, I liked your Ragi roti but could not comment on the post for some reason. Wonderful colors! Now I’m dying for mango and roast corn! Thank you so much. I am crazy about mangoes and roasted corn too! What a pretty salad! I love the flavor combination, and the color contrast! Corn chat is my favorite snack and the bhel mixed salad version look super healthy n delicious! Thanks Molly! You are a doll! It is a major blizzard, right? Take care. We may or may not get the tail end of that storm they say. Good to have Indian food and wine ready! Is this for real? Beautiful! !